Besides poor performance of its phones in the Indian smartphone market, the Taiwanese company now has one more thing to worry about. And that is the anti-HTC campaign being run by mobile phone retailers in the city of Delhi. Consumers have long been complaining about super-expensive price tag of HTC phones, but we never thought that it would come to this. This protest is not about the outrageous price tag at all but is about their quality of service and after-sales support. A number of mobile phone retailers in Delhi are putting up banners advising customers to not choose HTC phones for their poor quality of service. These banners are either hung outside the shop or are fixed at the payment counter. Who’s Doing It & Why? These posters have been circulated across various markets in Delhi by an unregistered entity named Delhi Mobile Sellers Association. According to a distributor, this issue originally surfaced from Karol Bagh’s Gaffar Market. Distributors are complaining that HTC is unwilling to provide customer support for repair and servicing of its phones whether purchased online or offline. Retailers fear that if they sell such phones, then they’ll risk losing their customers forever. As per the news published on TOI, an HTC Customer Service Official denied any such issue in the company’s after-sales support and even went on to add that this might be either an attempt by the rival brands to tarnish the company’s reputation, or a problem at local corners. There is no official confirmation from HTC India about this, but we seriously doubt that any reputed smartphone company would act like this for fending off the competition. Things will get more clear in the due course of time, but we will still advise you to check the quality of service at your nearby HTC service centre before making a buying decision. Better safe than sorry. "Unbelievable! 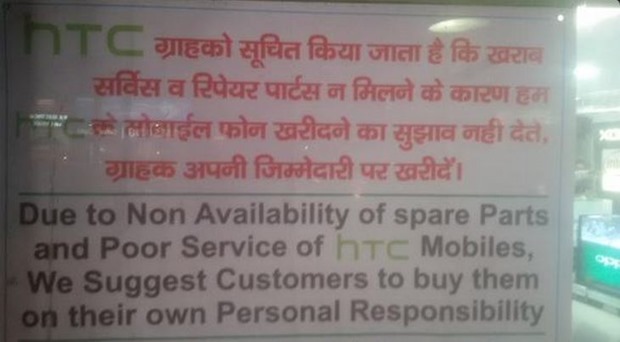 Retailers Are Running An Anti-HTC Campaign In Delhi. Here Is Why", 5 out of 5 based on 1 ratings. Its better to have apple instead of HTC. I agree that HTC is complete ignorant about the post sales service. My phone has a typical issue where it wouldn’t allow me to switch from Speaker phone to headset. It would disconnect. I sent it to TVS and they said the mother board has gone bad and it took more than 10 days to repair. The problem got solved for a while and now it is again doing the same. I don’t have time to give fro repairs. So i bought a one+one and abandoned the HTC. IN my opinion, DO NOT BUY ANY ANDROID EXPENSIVE PHONE AS THEY DON’T GO A LONG WAY! On the other hand my son had a iPohone6+ and it was giving problem. He went to Apple store in New York and they replaced it without any fuss! I am not sure Apple would do the same in India but that is the way to treat the customer! Hope HTC is listening! peoples believe that the unavailability of parts is the mistake of shop peoples. So this campaign should be helpful for open the HTC peoples eyes. The same is applicable for Lenovo, Micromax and some other companies. There are a number of service centers (run by TVS Electronics), but they are unwilling to provide proper service. I happened to visit one of the so called service centers (TVS Electronics, Satellite, Ahmedabad) and they denied to resolve my problem upfront! This was not all, the executives sitting at the front desk were mobile illiterate and ill mannered. One lady was shouting at a customer, the other was hitting her colleague with a customers phone and the third one did not know how to switch off the phone. This was not all. There were queues, even for customers who had come their to collect their phones and they had to wait for hours for their turn. Ridiculous.